Distinguished and full of purpose, the Amish Lincoln Desk is a mixture of a spacious writing desk and a fully functional computer desk. This lovely solid wood desk makes a great addition to your home office, a quiet corner in your bedroom, or in a spacious hallway. All of our Amish desks are handcrafted by skilled Amish woodworkers and the Lincoln provides an attractive design to work at. One file drawer provides room for hanging files, two storage drawers hold office items and one pencil drawer holds all writing utensils. With graceful panels on the sides and a slender bridge, this desk brings just the right mixture of design and duty to support your deskwork. 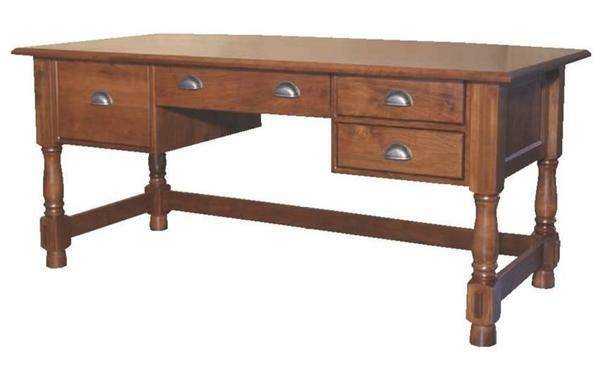 Take a look at all our Amish desks have to offer on our blog, "Timber to Table." Select the right Amish Desk Chair to support you as you read, write or work on bills and general correspondence. This Amish desk is completely customizable in your choice of wood and stain. Call one of our Amish Furniture Specialists today, toll-free at 866-272-6773 with any questions. We are always happy to assist you. Shown in Brown Maple with Michaels Cherry stain.